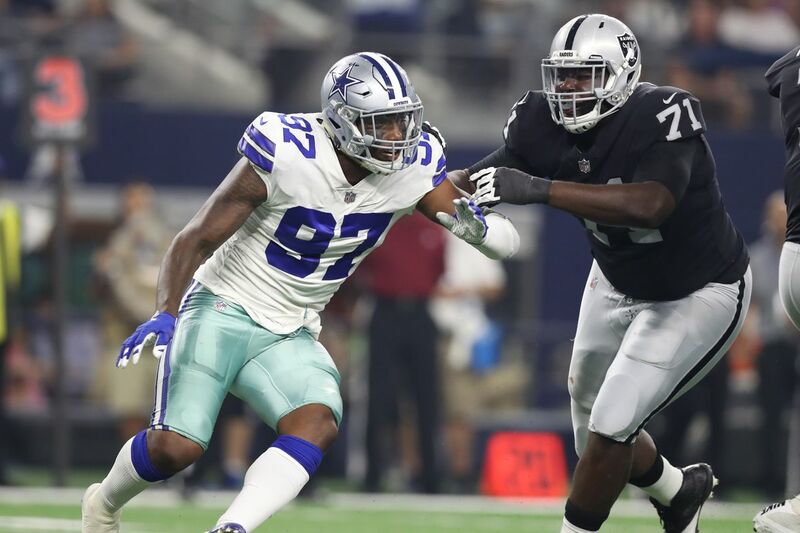 Following the Cowboys 24-20 victory over the Oakland Raiders, it’s time to check in with the rookies who got their night’s started in the second half of the game. First, a reminder of our grading system. Taco has been by far the brightest spot in a rookie class that is almost completely hamstrung. He and Damontre Moore have teamed up well on the second unit in the past few weeks. Taco’s play of the night was a sack that came in the third quarter, on 2nd and 7 at Oakland’s 10-yard line. Much like his first sack two weeks ago, he blew by his opponent with ease. David Sharpe, a fourth-round rookie, was the former starting left tackle at Florida. In four outings, Taco has gone from a knee-jerk bust to sharing the team’s preseason sack title with Moore at two a piece. Those two guys count for half of the eight sacks Dallas has accrued. For what it’s worth, Taco is tied for eighth in sacks during this preseason. The only other first-round pass rusher in that Top-10 is the Eagles’ Derek Barnett, who ranks first with three sacks. Charlton’s training camp and preseason performances have followed similar to his collegiate career. Each week, he gets a little better. That’s certainly good news for the future of this pass rush. It’s really been the biggest let down to not have the opportunity to see these guys get after it. Stephen Jones did say that Awuzie and Switzer could play next week versus Houston. Awuzie was said to be able to return but the trainers want to be cautious for another week. Lewis is not likely to suit up in the preseason and his hamstring may linger into the regular season. What more can be said about perhaps the greatest blessing bestowed on the Cowboys this preseason? Even though Rush had that weird fumble upwards that was an incredibly athletic play and score for rookie linebacker LaTroy Lewis, Alfred Morris’ weak attempt to block was the culprit. Rush recovered from that and led the Cowboys to his third win in the preseason. More importantly, all three of Rush’s wins have started with the Cowboys’ trailing. Rush was 12 of 13 passing for 115 yards, two touchdowns, and an impressive 143.1 passer rating. The debate-that-never-was is clearly over and Cooper Rush is the deserved winner of the QB2 label. He was given almost all the second-half reps with Kellen Moore getting the last offensive series. Overall, Rush has completed 38 of 51 passes (74.5%) for 398 yards, six touchdowns, and zero picks, with a 135.9 passer rating. It’s going to be extremely difficult for the Cowboys to keep four defensive tackles with all the versatile ends they have. With that said, if anyone is pleading his case, it’s Lewis Neal. He showed up big time in this game with a sack and a tackle for loss. Neal has looked better than the two seventh-round picks. With needs elsewhere and all the position flexibility, Neal still has a large climb to a spot on the 53. Despite not recording a single stat line for the evening, Brown should feel confident that the team likes him. Brown was given snaps in this game with the first-team which is a win in itself. There was only one play that came his way but he failed to come down with it. It was a first-down heave that was well played by the two defensive backs near him. Still, getting work with the first-team is big for him. Much like last week, it was just great for him to be on the field. He had a few miscues as to be expected but he was able to get a tackle for loss notched on the belt. It showed his incredible awareness as he sniffed out a screen and created the loss. While Anthony Hitchens rehabs over the next eight weeks, don’t expect Jaylon to be the starter. They will likely look to Justin Durant but Smith is likely to see an increase in his contributions. It’s been a long process with him but each week he gives a little more of a glimpse into what he’s capable of.